Conservation leaders, federal and state officials, and other partners gathered today on the Patapsco River to celebrate the removal of Bloede Dam – an effort that has been a decade in the making, and will have major benefits for fisheries, public safety, recreation, and the health of the Chesapeake Bay. Bloede Dam has served no functional purpose for decades and has posed a serious public safety hazard in Patapsco Valley State Park. There have been a number of injuries and deaths, with at least nine dam-related deaths since the 1980s, the most recent of which occurred in June 2015. 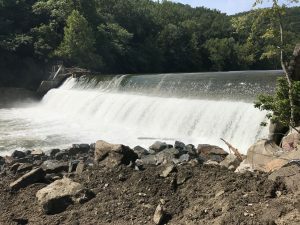 Keeping the dam in place also would have been costly to taxpayers — at least $1 million would have been needed for repairs to comply with Maryland dam safety requirements. In addition to eliminating the public safety risk, dam removal will give a tremendous boost to the health of the river ecosystem, including fisheries critical to the food web of the Chesapeake Bay. Bloede Dam serves as the first barrier on the Patapsco River blocking migratory fish swimming to and from the bay. Its removal is the linchpin of a decades-long restoration effort that also included the removal of Simkins Dam (2010) and Union Dam (2011). Removal of Bloede Dam will restore more than 65 miles of spawning habitat for blueback herring, alewife, American shad, and hickory shad in the watershed, and more than 183 miles for American eel. The benefits of the project extend beyond the river environment to coastal habitats, where sediment carried by the river will replenish marshes and beaches, making the coast more resilient to extreme storms. Since Hurricane Sandy struck the East Coast in 2012, the service has helped fund 30 coastal resilience projects in 11 states, using more than $100 million from the Disaster Relief Appropriations Act of 2013. Twelve dam removals have restored nearly 100 miles of river to their natural state. Following the initial blast of explosives to breach the dam, crews will continue demolition work for the next three months. The site will remain closed to the public until July 2019. Removal of Bloede Dam was made possible through a partnership of American Rivers, the Maryland Department of Natural Resources, Maryland Department of Transportation State Highway Administration, National Oceanic and Atmospheric Administration, U.S. Fish and Wildlife Service, the Friends of the Patapsco Valley State Park, as well as monitoring partners U.S. Geological Survey, Maryland Biological Stream Survey, Maryland Geological Survey and University of Maryland Baltimore County. The total cost of the project is estimated at $17.3 million. Funding for the project has come from the Maryland Department of Natural Resources, MDOT SHA, NOAA, the National Fish and Wildlife Foundation, U.S. Fish and Wildlife Service, the Coca-Cola Foundation and Keurig-Green Mountain.